Two surveys bode well for digital publishing, HMH teams with Amazon, and books aren't the library's only game. Here are a few of the stories that caught my attention this week in the publishing space. 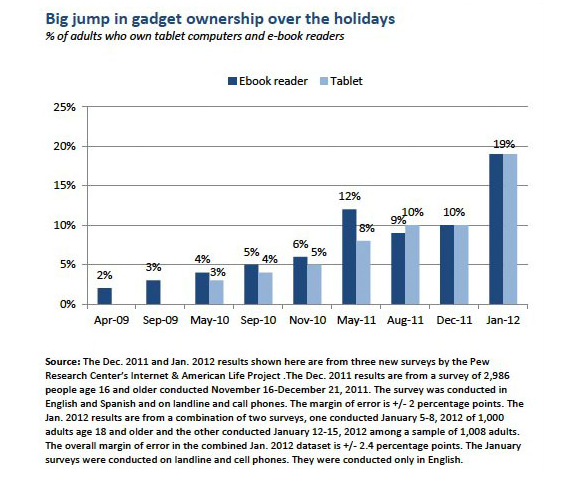 Back in June, a survey conducted by the Pew Internet & American Life Project showed ereader ownership in the U.S. had doubled in six months. As impressive as those statistics were, the latest survey released by the company this week showed that both tablet and ereader ownership in the U.S. nearly doubled again, but in a much shorter time frame between mid-December and early January (the holiday season, of course). The survey also indicated that “[t]he number of Americans owning at least one of these digital reading devices jumped from 18% in December to 29% in January.” And ownership wasn’t gender biased in terms of tablets: The survey showed that the same percentage — 19% — of both males and females own a tablet. Ownership of ereaders, however, skewed female: 21% of women in the U.S. own ereaders but just 16% of the men do. Pew attributed the dramatic growth not only to holiday shopping, but to the timely release of devices priced in the double digits by Amazon and Barnes & Noble. Owen astutely observed that this agreement may pave the way for Amazon to get its books in the hands of Barnes & Noble brick-and-mortar shoppers, a feat Amazon has yet to accomplish. Also this week, Bloomberg Businessweek ran a feature piece on Larry Kirshbaum, the man behind Amazon Publishing East Coast’s success thus far — or “Amazon’s hit man,” as Businessweek dubbed him. The feature also dipped into the history of Amazon Publishing and its relationship to traditional publishing and the Big Six. It’s well worth the read. To stay current with the library discussion, other library experts to follow include Peter Brantley, Andrew Albanese, Justin Hoenke, and Sarah Houghton (to name just a few).